In-App Purchase allows you to offer users the opportunity to purchase in-app content and features. Purchases can be made within your app, or directly from the App Store if you choose to promote the products there. 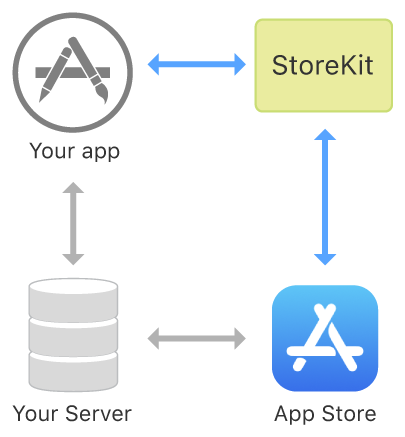 The StoreKit framework connects to the App Store on your app’s behalf to prompt for and securely process payments. The framework then notifies your app, which delivers the purchased products. To validate purchases, you can verify receipts on your server with the App Store or on the device. For auto-renewable subscriptions, the App Store can also notify your server of key subscription events. To use In-App Purchase, you must first configure the products you wish to offer users in App Store Connect. As you develop your app, you can add or remove products and refine or reconfigure your existing products. Consumables are used once and depleted, and can be purchased multiple times. Non-consumables are purchased once and do not expire. Auto-renewable subscriptions to services or content are purchased once and renew automatically on a recurring basis until users decide to cancel. Non-renewing subscriptions to services or content provide access over a limited duration, do not renew automatically, and can be purchased again. Non-consumables and auto-renewable subscriptions can be synced and restored across devices using StoreKit. When a user purchases an auto-renewable or non-renewing subscription, your app is responsible for making it available across all the user's devices, and for enabling users to restore past purchases. Downloadable content associated with a product. A product promotion controller for customizing the order and visibility of in-app purchases per device. Test your in-app purchases before making your app available in the App Store. Offer introductory pricing for auto-renewable subscriptions to eligible users. Test your introductory pricing in a variety of user scenarios. Generate a key and configure offers for auto-renewable subscriptions in App Store Connect. Offer discounted pricing for auto-renewable subscription products to eligible subscribers. Create a signature to validate a subscription offer using your private key.